Patricia Wells has long been a favorite cookbook author of mine. I have a number of her books, one of my first Patricia Wells acquisition was Home in Provence. Paging through my well used copy, I have noted “excellent” by so many of the recipes. I love cookbooks that are a sure bet~this is one of those. 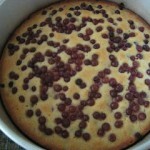 Every year at this time, I pull it out to make her Winemakers’ Grape Cake. My seasonal trigger is when I see champagne grapes at the store. 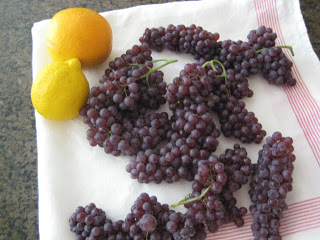 (I have found them at Whole Foods and Trader Joes) I have never made it with regular table grapes- if you do, let me know how it turns out. However, if you can get your hands on the petite champagne grapes, do use them. It is a simple cake, but one that I anticipate every year. The champagne grapes make it a uniquely special treat. So far this summer, I am on cake number three and counting. Combine the eggs and sugar in a large bowl. Using an electric mixer, whisk for about 3 minutes. Add the butter, oil, milk, and vanilla mixing completely. In a medium bowl, combine flour, baking powder, and salt. By hand whisk together. Add lemon and orange zest, whisking to combine and coat zest with the flour. Slowly add the flour mixture to the batter. Mix at low speed until combined. Let rest for 10 minutes. Add 3/4 of the grapes to the batter, gently mix. Pour the batter into the prepared springform pan. Bake for 15 minutes. 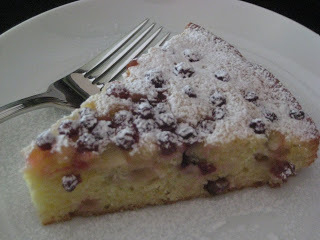 Remove cake from the oven and sprinkle the remaining grapes over the top of the cake. Return the cake to the oven, continue baking for about 40 minutes or until the cake is firm and golden with the edges pulling away from the side of the pan. Cool for 10 minutes. Remove the side of the springform pan and let cake cool to room temperature. Sprinkle with the powdered sugar before serving. I have waited a year to eat this today my brother in-law baked me one and it was awesome!